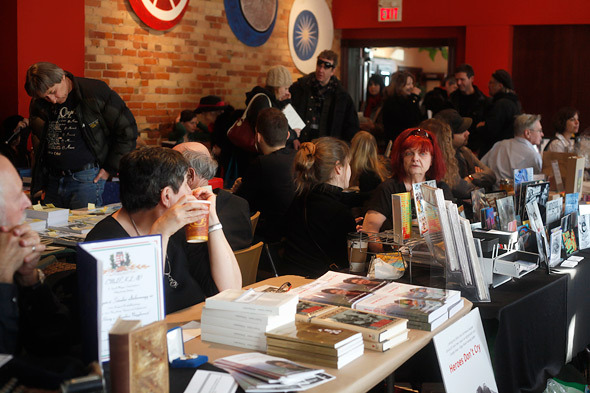 On Saturday, local authors and a range of publishers gathered at The Gladstone Hotel for the Small Press of Toronto Book Fair (or SPoT for short). 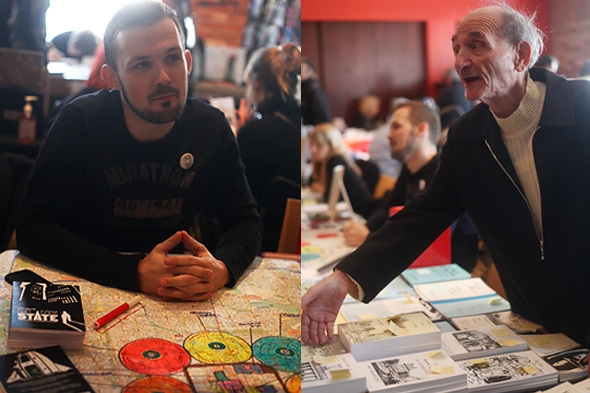 In its 22nd year, the bi-annual event stocked shelves with a high calibre of printed works, from glossy books, to comics and zines, to arty chapbooks, handmade crafts, and more. 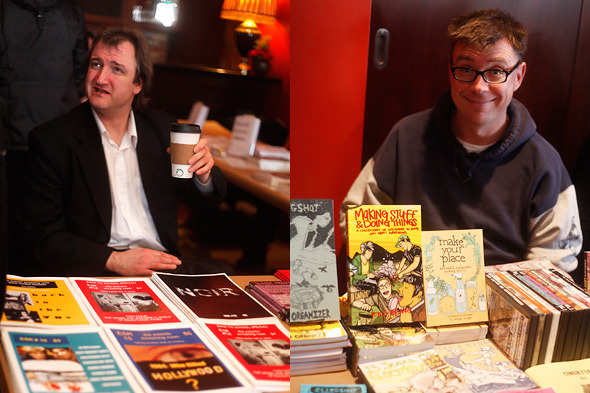 Since its inception in the late eighties, SPoT has given small press and first-time publishers an outlet in Toronto. Although much has changed since then (bye bye, Flock of Seagulls haircut), the fair still remains a great opportunity for publishers who have few resources, less places to distribute and a general lack of monies. Authors and publishers can not only reach a wider audience, but also network and meet other members of the cozy publishing community in Toronto. Take for example, Dave Proctor (on the left), founder of the DIY alt-lit publishing company Wooden Rocket Press. "I met a couple people at the last fair, and made a goal for myself to be at the next one." 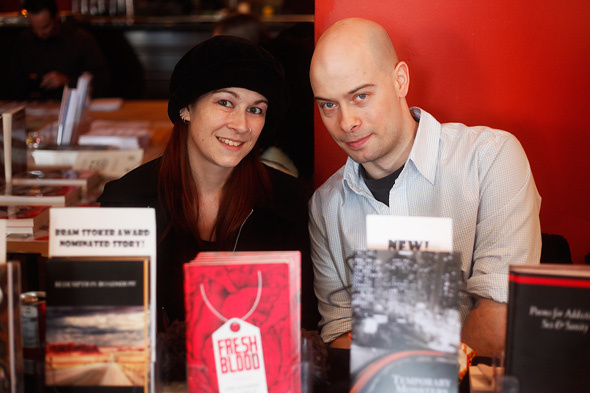 He recently published his first novella, Blank State, about a "condopocalyptic" Toronto. Then you have characters like Ray Margulies (on the right). The author has been publishing historical fiction and poetry with small press publisher CJS for over 30 years. Sonya Watson (pictured left) is another publishing newbie. The York University student learned quickly that publishing was "all about relationships and connections." Quick tip: Watson found her editor using Google. Sigh, I âĽ the internet. After talking to Monica S. Kuebler, writer & editor of Burning Effigy Press, I got the impression that self-publishing has become increasingly affordable and more professional (at least visually), thanks to certain technological innovations. "Before, I used Pagemaster on a busted old Mac... and now I use Quark and Photoshop. The process is much quicker and the quality is better." I also chatted with Greg Woods (pictured left), creator of film journal The Eclectic Screening Room. "Over the years, [the Fair] has become much more diverse. There's lots of stuff sold today that was not seen back in, say, 2001," said Woods. Stuff like bug buttons and bicycle stickers by Megan Speers (whose novel Wanderlust was published by The Porcupine's Quill) and pretty postcards by 52 Clouds In The Sky. 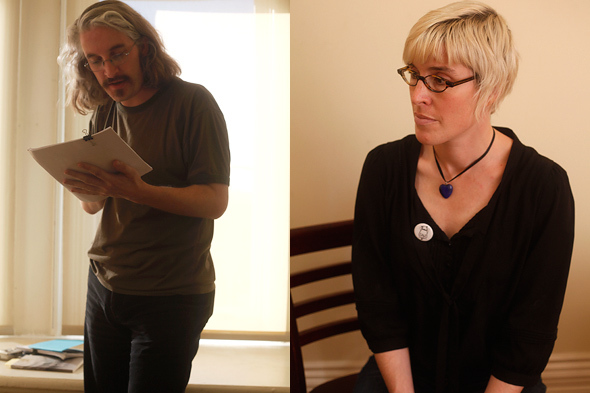 "Some veterans may frown upon that," continued Woods, "But it's all local and reflective of small press." 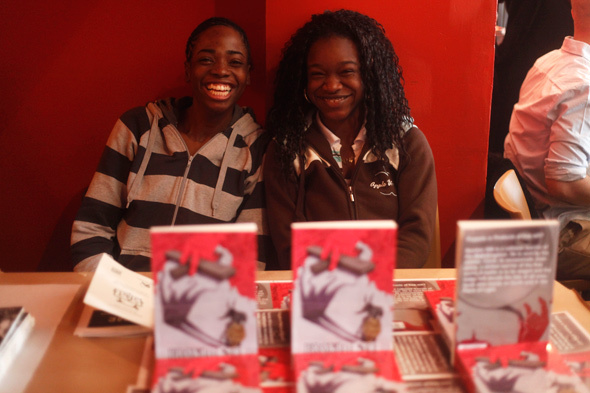 "Publishing has changed a lot," said co-organizer and author/poet Lisa Pasold (pictured right). "It's more doable technically. There are more usual-looking books." That's not to say that handcrafted, unique looking books are not popular anymore. 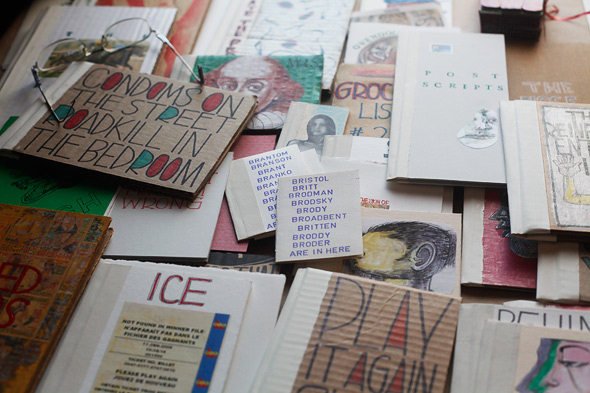 Visual artist John Laughlin, of Sherwood Press, has been displaying these eccentric and tactile collage books since 1992. "Lots of people who used to be here have gone on, but I do see some familiar faces." 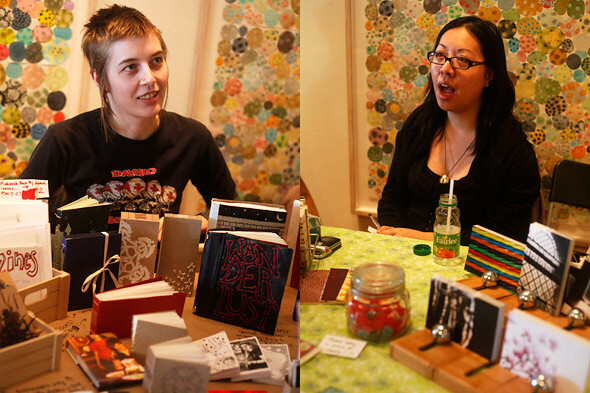 Organized by the Toronto Small Press Group -- a non-profit arts organization dedicated to the promotion of publishing and writing on a local level -- the fair also featured projects by Bits of String Press, Carousel, Fangs'n Hiss, The Workhorsery, Darling Magazine and Worn Fashion Journal. Previously held at the Trinity St. Paul's Church on Bloor Street and the Toronto Reference Library, the Gladstone was an interesting choice for a venue. The layout was somewhat cramped and confusing -- some visitors didn't realize that there was more to be discovered on the second floor. It's too bad the Reference Library was undergoing construction; seems like it would have been the preferred spot. 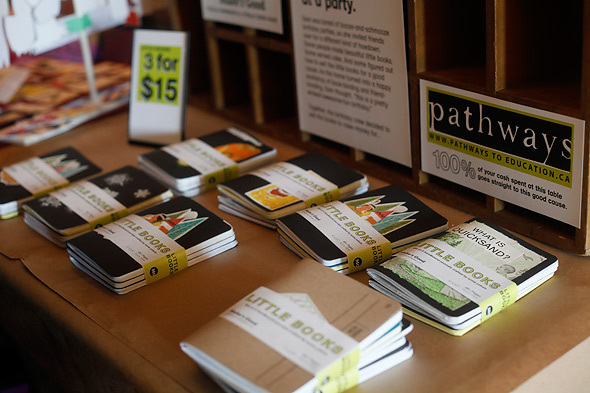 Cramped quarters aside, the Fair was a great showcase of high quality and unique local-based printed work.